In what has become known by some as the scandal that just will not go away, Towson’s “Treegate” persists. Thirty trees removed at the direction of a county official last year to assist developer and generous campaign contributor, Caves Valley Partners (CVP) with its private development project, live on to hold a county government accountable when elected officials have failed to do so. Last year, when Baltimore County’s Administrative Officer Fred Homan gave the order to remove a building and the trees from a county-owned property that was to be sold “as is” to the Towson-based developer, he did so in defiance of a legislative resolution that specifically protected the trees. But according to email records obtained by The Baltimore Post through a Maryland Public Information Act request, Mr. Homan did not act alone. 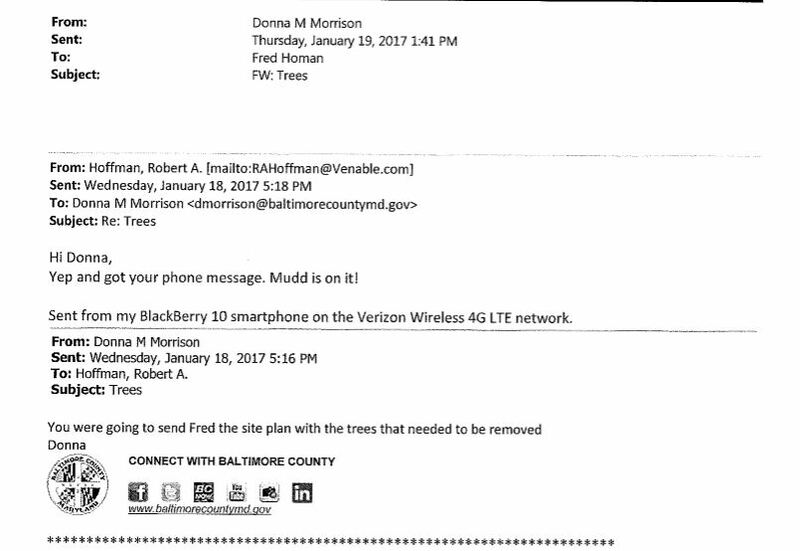 In a January 2017 email with the subject line “trees,” Mr. Homan’s deputy administrative officer, Donna Morrison, reminded a partner of Venable, LLC, the law firm which represents CVP, that Mr. Homan had apparently been awaiting information needed in order to move forward with the tree removal. “You were going to send Fred the site plan with the trees that needed to be removed,” Ms. Morrison wrote to Robert Hoffman of Venable. Christopher Mudd, also a Venable attorney, represents the developer. Ms. Morrison then forwarded Mr. Hoffman’s message to Mr. Homan. In 2012, County Executive Kevin Kamenetz put up for sale the old firehouse at the corner of Bosley Avenue and York Road, now known as Towson Gateway. After the county initially accepted and then disqualified another developer’s bid, CVP won with its $8.3 million bid on the 4.6 acre property. But its plan to build a Royal Farms gas station and convenience store at the site angered residents who immediately protested the development plans. The site was also not zoned for a gas station. Despite community pushback, District Five Councilman David Marks, a Republican, introduced a Planned Unit Development application to the county council after he said he was allegedly threatened by County Executive Kevin Kamenetz through the cell phone of CVP partner, Steven Sibel. The threat, which was documented by three independent witnesses who spoke with the councilman immediately following the encounter, was that $8.3 million – the price of the sale to the developer – would be withheld from his district’s communities unless he put forward the PUD for CVP. Without the PUD, CVP would not be permitted to build the gas station. The PUD passed unanimously by the county council in December 2016 and allowed a zoning exemption so that a gas station could be built on the property. Included in the language of a PUD resolution, however, was specific protection of trees on the property. Using taxpayer dollars from the county’s ground maintenance funds, County Administrative Officer Fred Homan defied the county council’s legislative resolution which protected the trees when he gave the order to remove them. The cost to remove the trees, which included expedite charges to perform the work over a weekend, cost the county $29,052. Mr. Homan also ordered the demolition of a building last spring, at the county’s expense, in order to move the sale along. 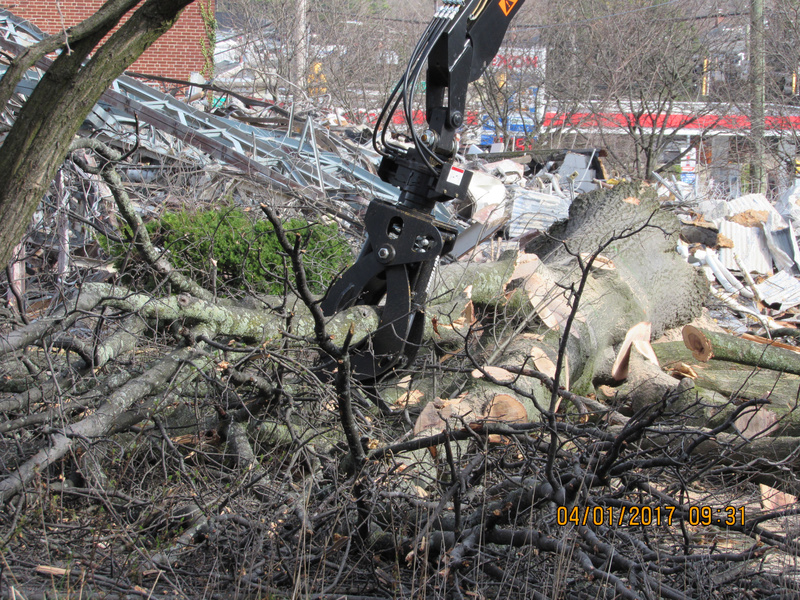 In all, the removal of the trees and building cost the county at least $120,000. Mr. Homan’s order to remove the trees also bypassed a public meeting that would have forced the county to discuss the developer’s concept plan which included the trees and the county’s need to adhere to forest conservation laws. But it was one year before when Mr. Homan ordered the trees removed, in April 2016, that the developer applied for – and then withdrew – a variance application for the removal of six specimen trees on the property. Six of the 30 trees were of an age and size that protected them under state law and created an impediment for CVP and its development plans. That same month, engineers created a Preliminary Forest Conservation Plan for CVP, a plan that Mr. Homan originally told a Baltimore Post reporter through a spokesperson last fall, did not exist. The plan would serve to further protect the trees and would require an official process to be followed for their removal. Removing the trees eliminated the impediment to the development process for CVP. In August, County Executive Kamenetz, a Democrat who is running for governor, encouraged the developer and community members to mediate over the lack of agreement about CVP’s development plans. However, as previously reported by The Baltimore Post, Mr. Kamenetz failed to tell the community at that time that, just weeks prior, the county had quietly extended the sale date of the property by five years, giving CVP an advantage unknown by the negotiation committee and county council members. Tonight, the county council will meet to vote on a roughly $1.4 million price reduction for the Towson Gateway property. CVP has asked that the price be reduced as part of its negotiations with advocacy groups to remove the gas station component from its development plans. But according to a representative close to those negotiations with the developer, CVP added a stipulation that allows the developer to retain the option to revert back to the gas station component if all agreements are not met. Former Anne Arundel County attorney and commentator, David Plymyer, recently reported that the actual sale price for the property council members will vote on tonight, will sink even lower due to the county’s calculation used for revitalization tax credits on the property. The developer will pay the county $5 million at settlement. The Baltimore Post informed the councilman of the emails Monday afternoon, when he returned a call regarding a different matter. Mr. Homan and Venable were not immediately available for comment for this article. The county attorney’s office did not respond with comment. The county’s deputy communications director told The Baltimore Post previously that her department will provide no further comment on the Towson Gateway issue. Correction: The county paid the contractor,, Excel Tree Service, $29,052 to remove the trees from the York Rod/Bosley Avenue property. 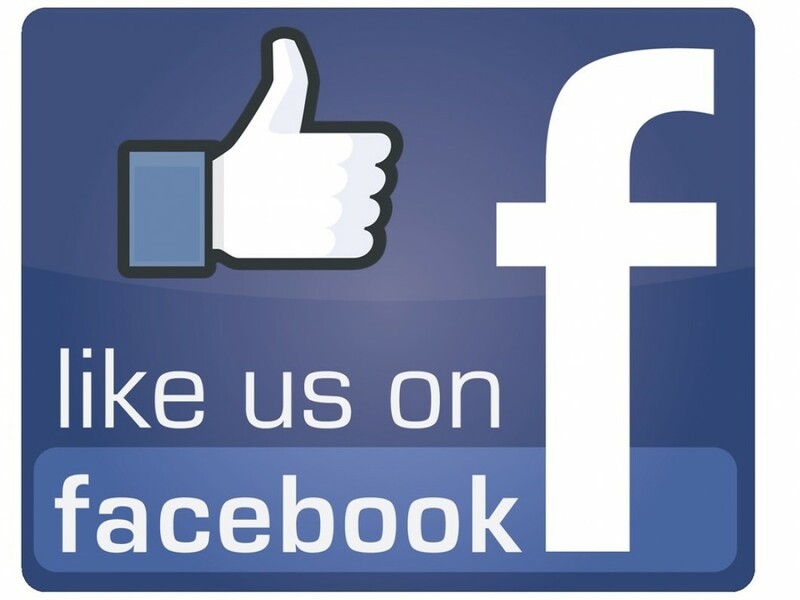 The Post incorrectly reported that the county paid $25,000. The Post regrets the error. Update 4/16/18: The Baltimore County Council voted to approve the price reduction of the Towson Gateway property to Caves Valley Partners.